Chinese imitations of consumer products is not new. It is now learnt that Piaggio was in for a rude shock when Chinese manufacturers displayed imitations of its premium Vespa scooters at the recently concluded EICMA 2013. 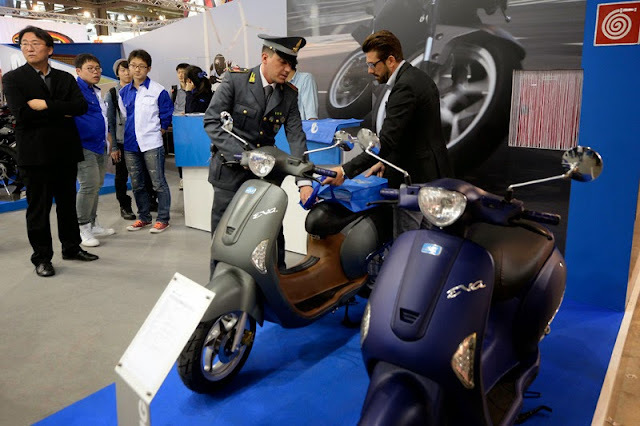 11 scooters being displayed by seven Chinese exhibitors were seized by the Mobile Unit of the Rho division of the Guardia di Finanza which is the financial law enforcement arm of the Italian military police. The vehicles that were seized had breached the exclusive right constituted by the three-dimensional trademark registered by Piaggio. It protects the characteristic shape of the Vespa and the design of the global and iconic scooter. There are two models here- the Vespa and the Vespa VX. The VX was launched earlier this year in July and is the pricier model of the two. Both the scooters are powered by a 3-valve single-cylinder four-stroke engine that generates 10PS of power and 10.06Nm of peak torque. A disc brake, modified speedometer, new pillion grab rail, beige seat cover and tubeless tyres were added features to the VX. More recently, at the EICMA, Vespa drew the covers off the new Primavera, which could replace the LX lineup. It shares the base powertrain with the LX series, with a few tweaks, but uses sharp new styling and a reworked frame to make the scooter more stylish. Vespa says there will be 125cc and 150cc 3-valve SOHC fuel-injected engines – based on the LX engines – in the Primavera. The engines have a new crankshaft, roller-rockers and a new bore and stroke to ensure better torque. The spark plug position in the combustion chamber has also been altered in the interest of economy, performance as well as improved cooling and easier maintenance. The new engine is lighter than before.